The stock market has risen 10% since President Trump took office. Despite widespread protest and tension about his presidency, the stock market obviously like the Donald in the White House. Being a person who is pro business, his policies will definitely be very good for companies. The bull market continues. Wow! What a nice bullish run in the stock market. 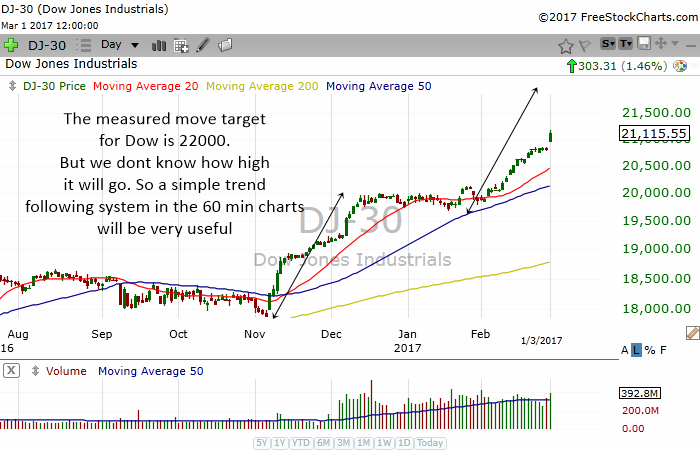 If we take a measured move target for the Dow, the target will be 22000. But we just don't know how far this thing will run. So we continue to look at lower time frame charts to determine the strength of the market. 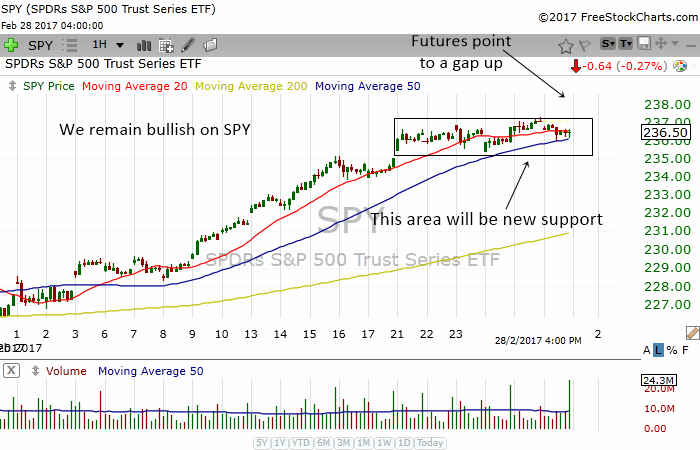 Looking at the futures today, the SPY is going to gap up. There will be another new area of support and the bullish run will likely continue. We will remain bullish on the markets. The SPY is still in a very bullish daily uptrend. It is above its rising 20 MA, 50 MA and 200 MA. Therefore, we will continue to be bullish on the stock market from a daily chart perspective. I have drawn a measured move target on the chart above. If all things work well and the measured move is true, then the target will be around $245. The chart above shows the 60 min chart of SPY. 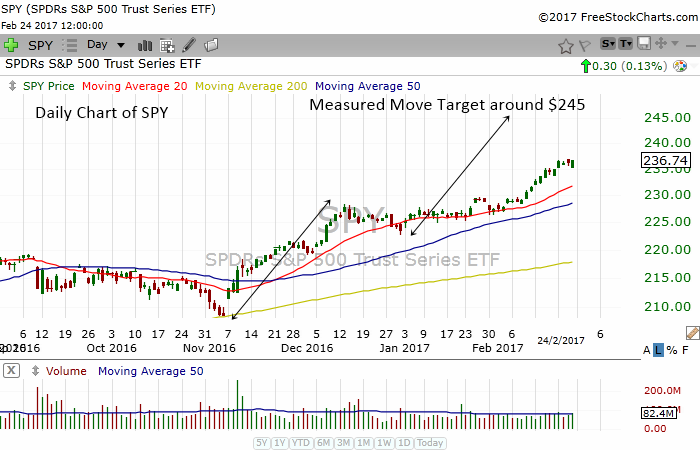 The SPY is in a bullish mode and thus we continue to be bullish on the S&P 500 index. 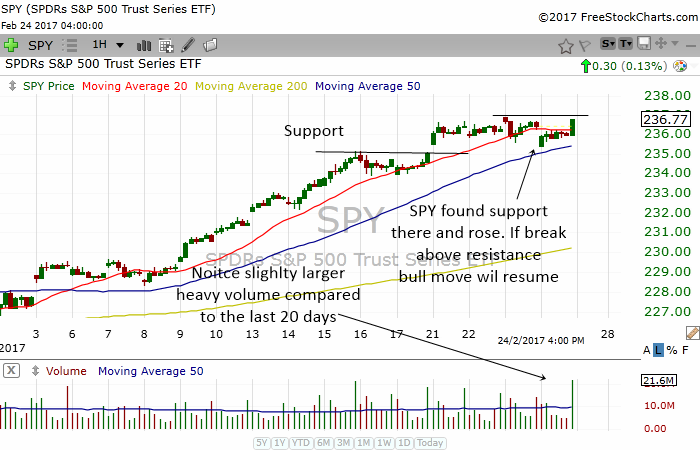 The SPY dropped and opened lower last Friday but it quickly found support at the area I pointed out in my last stock market analysis. 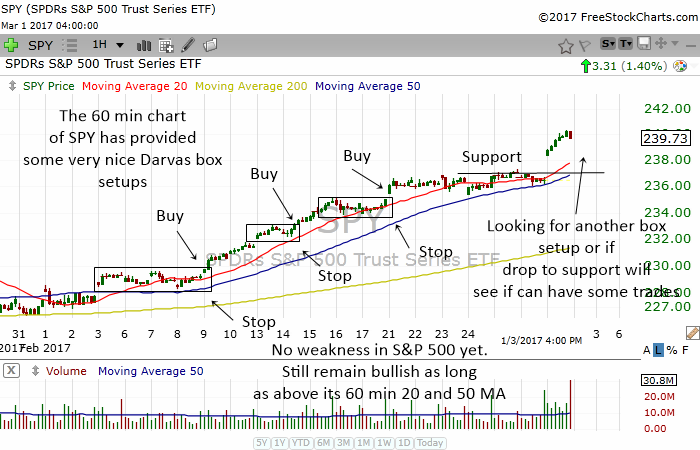 Now, the SPY is forming a new 60 min box and a breakout will make the bull move continue. The DIA pictured below is also forming a 60 min box. Stocks are still strong. Not much weaknesses yet. What we are seeing now is perhaps a consolidation (rest) before moving higher. 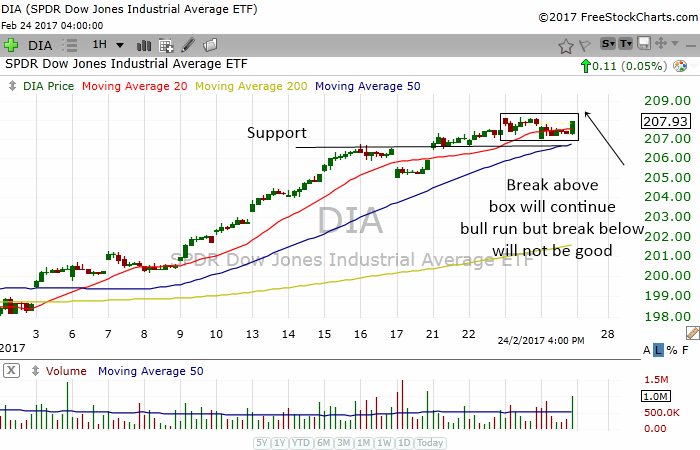 If DIA falls below the 60 min box and fall below the 60 min 50 MA, then we can expect a short term correction. Until then stay bullish!